Once upon a time the #1 online authority for these. 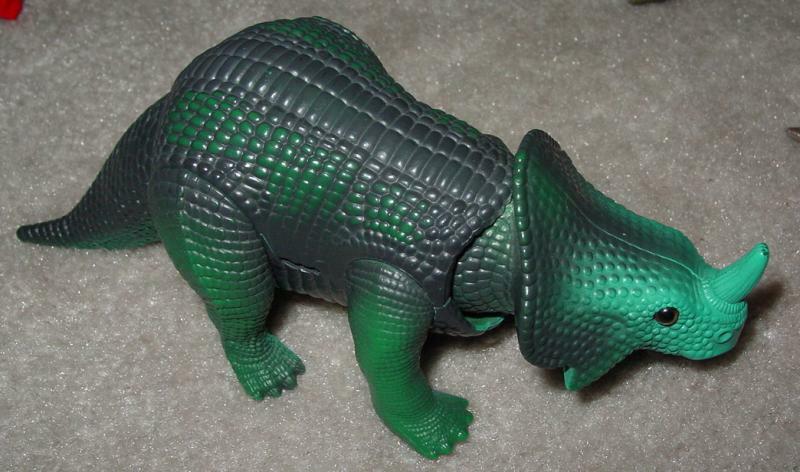 What happens when you mix Dinosaurs with futuristic people? 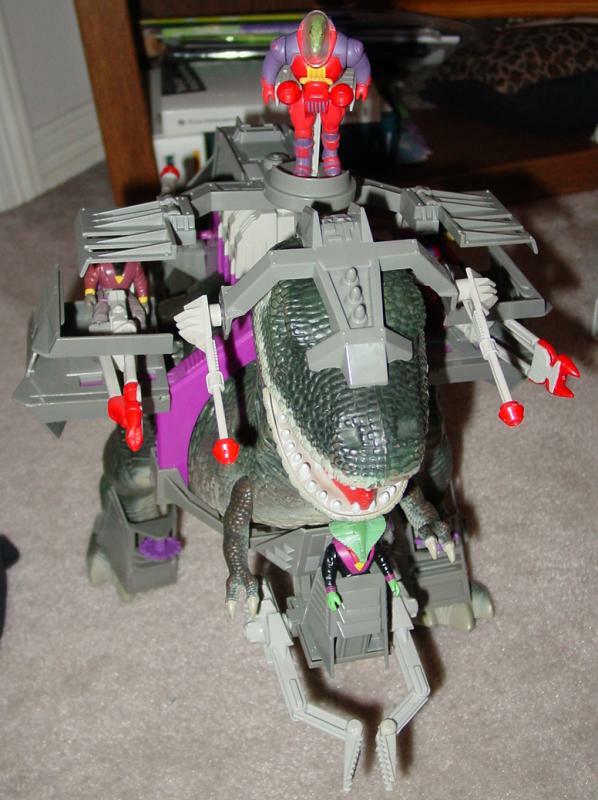 You get Dino Riders! 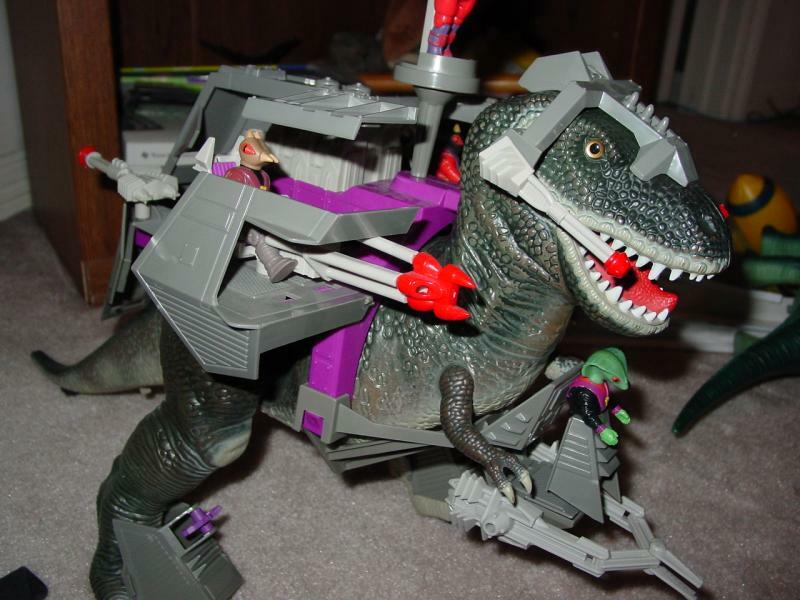 What kid couldn't love a heavily armored Tyrannosaurus-Rex with more guns than an Iranian family! 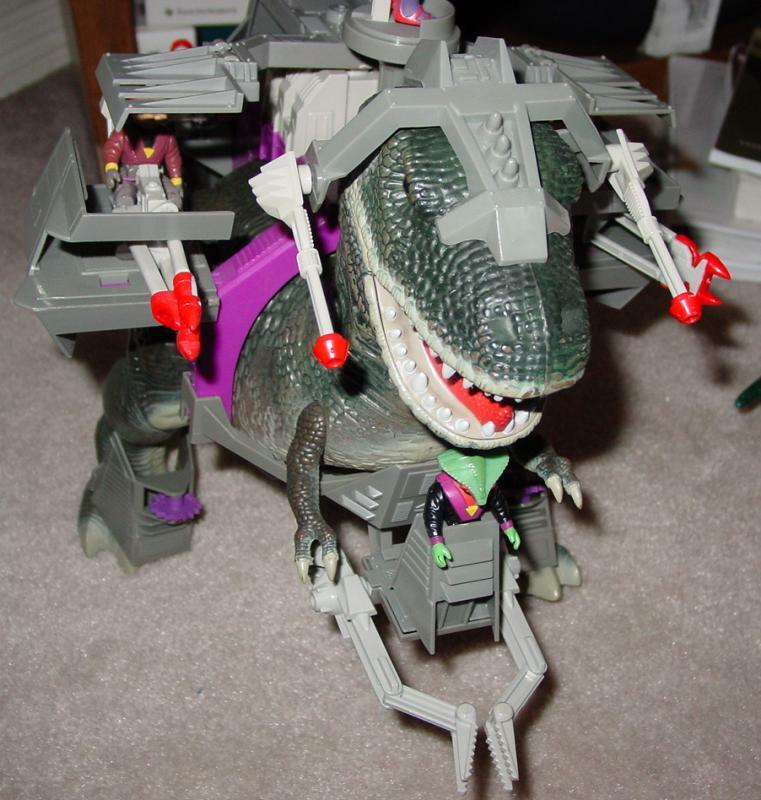 Who needs robots when you can put armor on a dinosaur and eat people with the dinosaur when the armor is damaged. 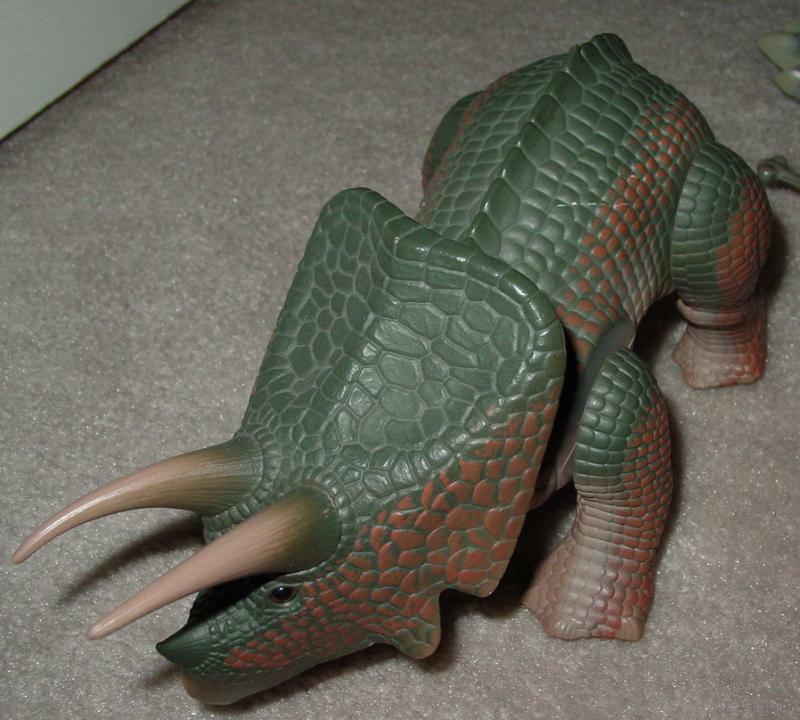 These things were also a TV show and a movie which gave you even more ideas as to how to destroy things with the Dinosaurs. I was too lazy to put the armor on most of the dinosaurs since most of it is slightly broken or the rubber bands have died. 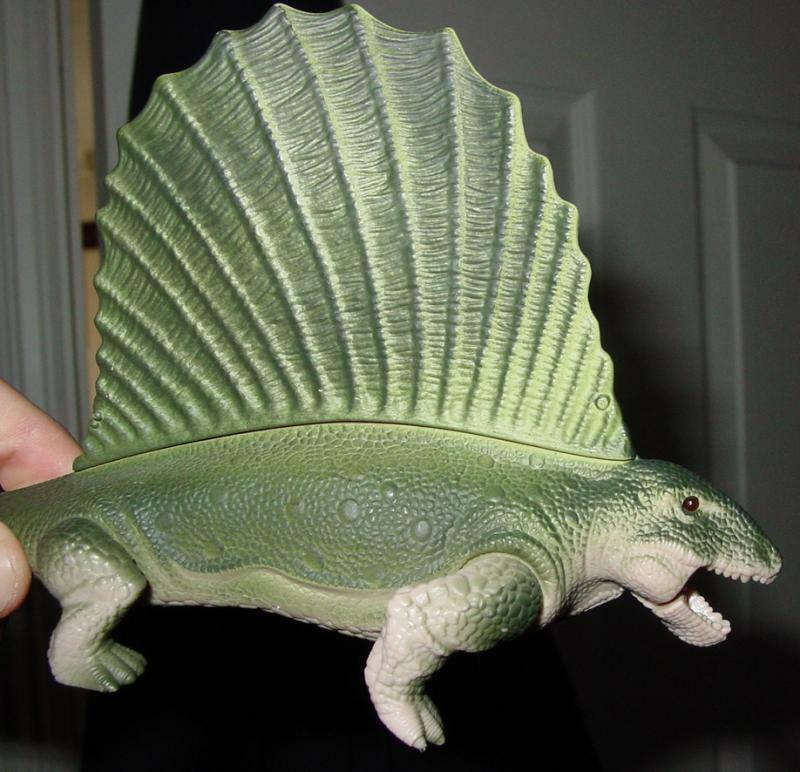 The pictures there include all the dinosaurs I have found. 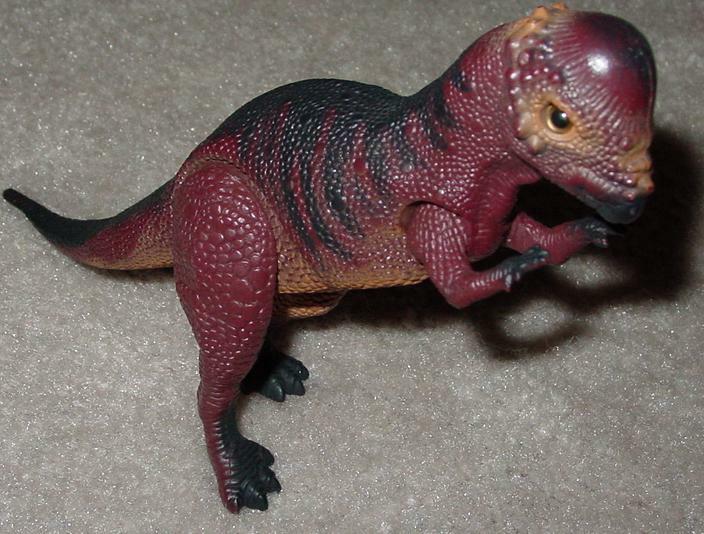 I know I had a few more including the Deinonychus, but I'm pretty sure he was crushed at some point. 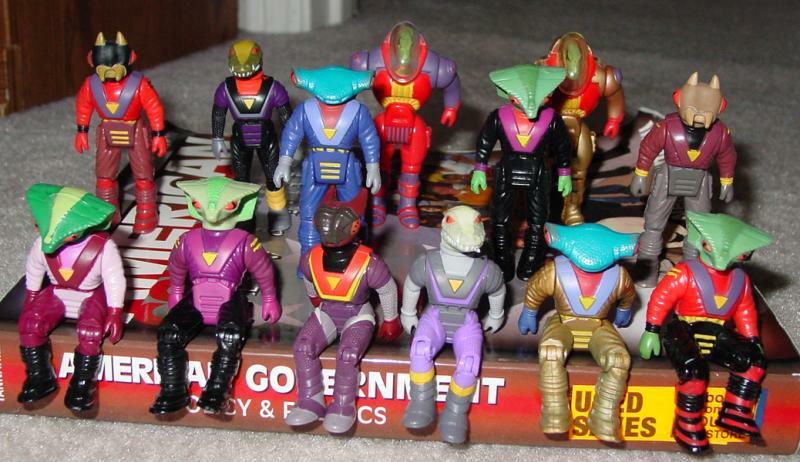 My cousin also had several, but I don't know if they still have any of them. The adventure's beginning is summarized in the opening credits of each cartoon. The Valorian home planet is conquered by the evil Rulon armada and a small band of Valorians led by Questar attempts to escape. The Rulon Flagship Dreadlock commanded by Krulos, the Rulon leader, chases after the renegade Valorian ship. The Valorians attempt to escape by using the STEP (Space Time Energy Projector). It works, except they're launched to 65,000,000 B.C. and crashland on the planet Earth. The Dreadlock was following closely and was caught in the STEP and follows them to earth. 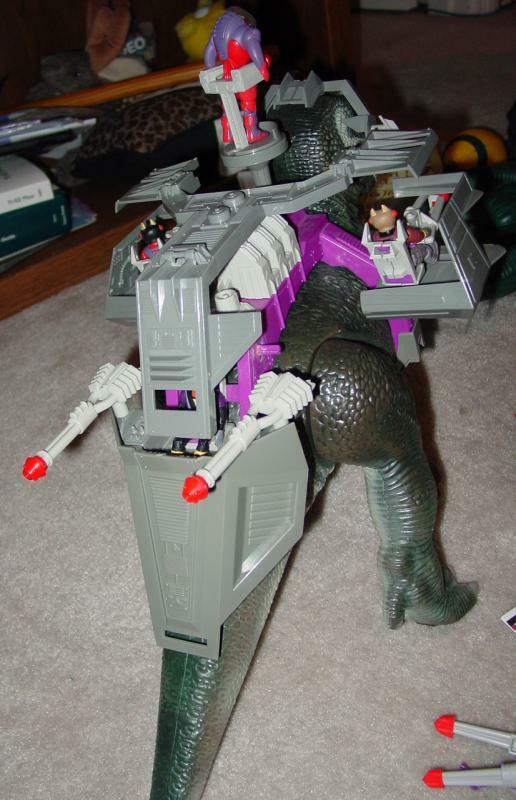 After investigating their surroundings, they manage to find one another, and begin assembling armies of Dinosaurs, since their ships have been ruined by the time warp. 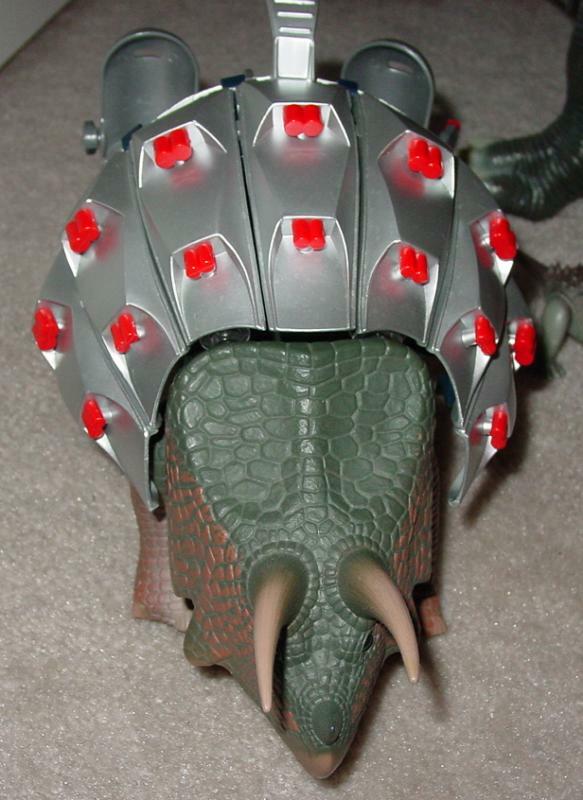 The Valorians befriend the Dinosaurs with their telepathy and medallions they wear around the neck, while the Rulons enslave them with Brain Boxes. 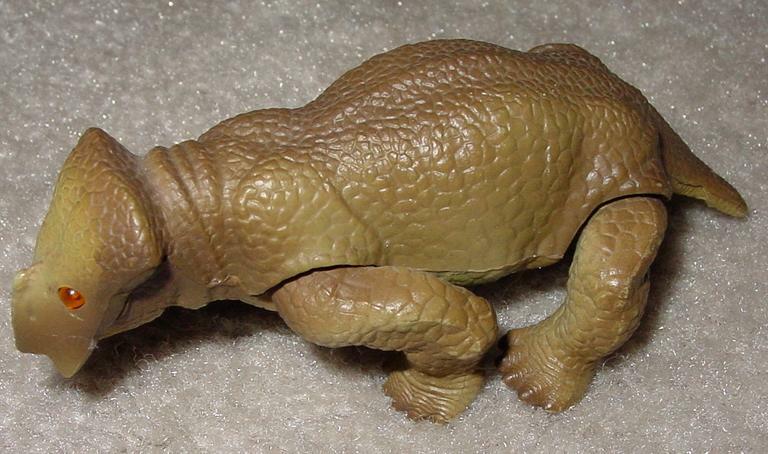 Mostly the Valorians befriend the herbivore Dinos while the Rulons take the Carnivores. An assorted bunch of Rulons. Krulos, Rasp, Hammerhead, Croc are some names that come to mind. 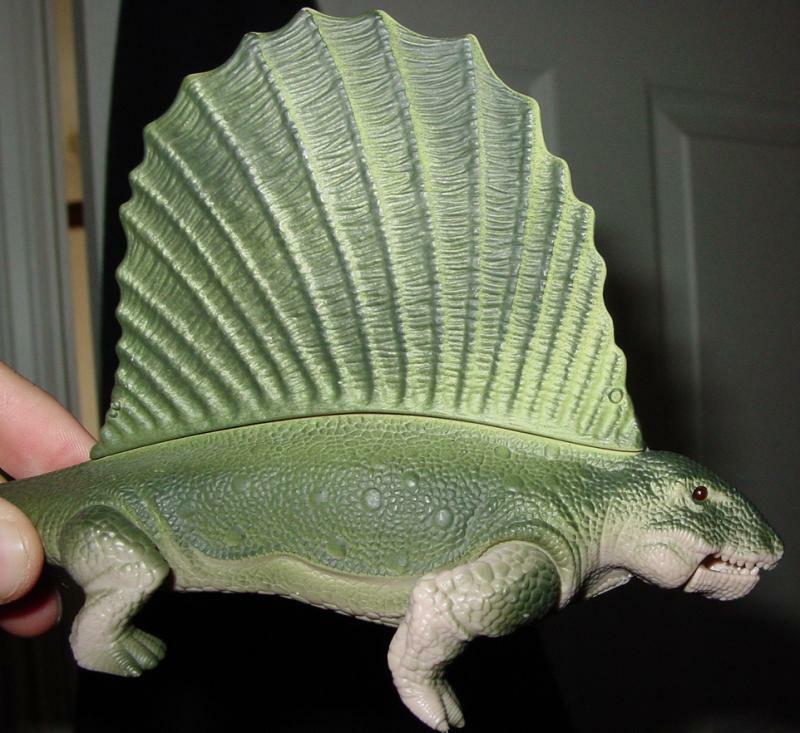 Dimetrodon, side view, tail of the Triceratops can bee seen. Demonstration of the Chomping Jaw feature. A view of the Diplodocus giving him a wise appearance. 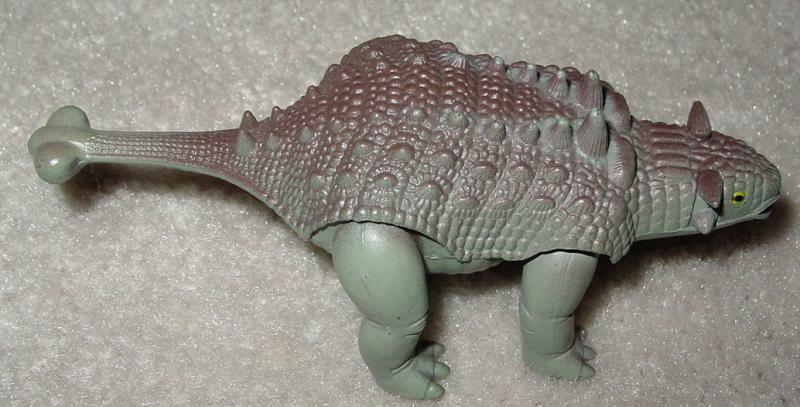 Edmontonia, Top view of this odd dinosaur which looks like it could be run over by a bus and not be damaged. 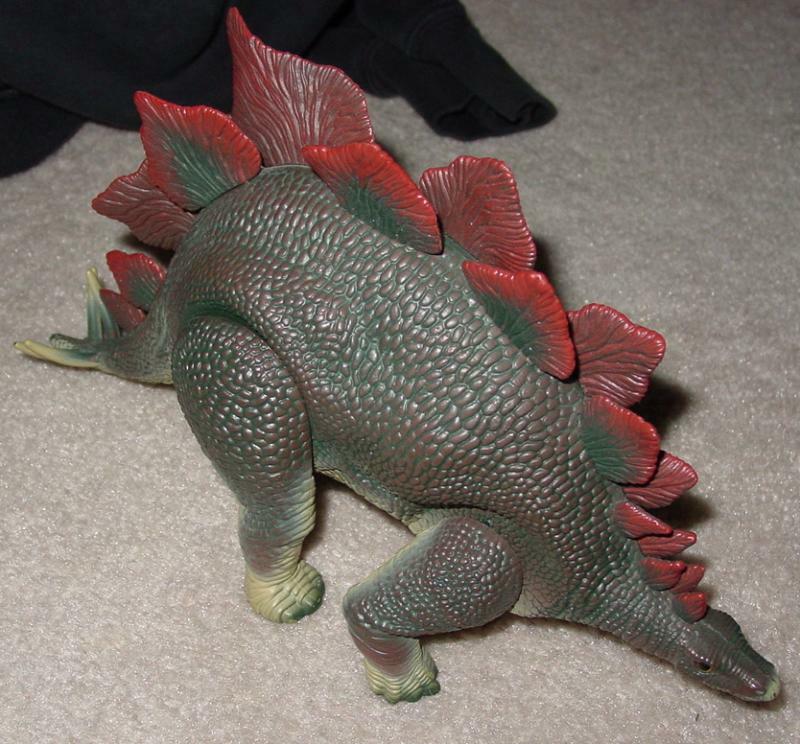 The other side of the spiked Kentrosaurus. 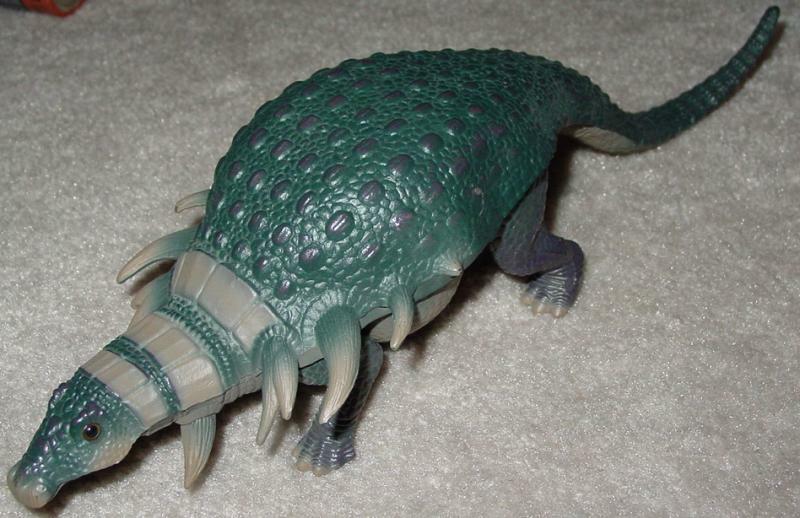 Monoclonius, This little guy was my first Dino Rider. I think they used to make this guy bash down walls in the cartoon. 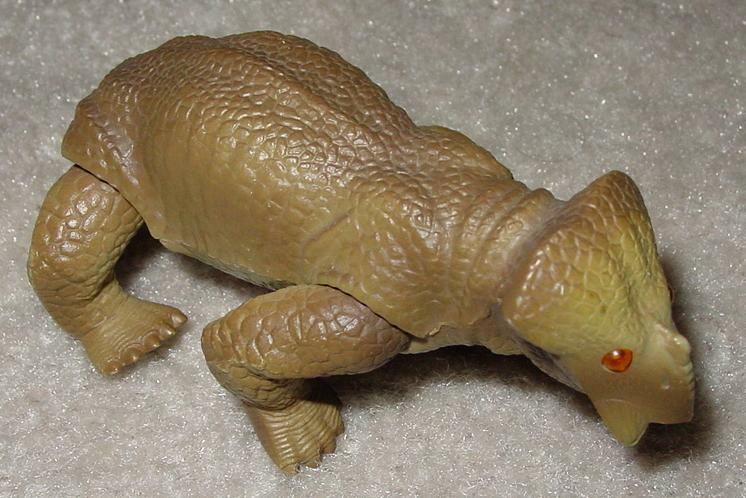 Placerias, the smallest Dino Rider I have. 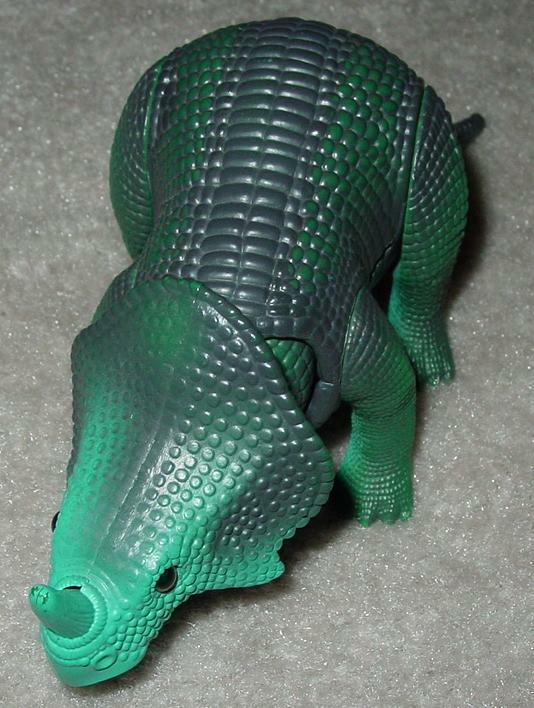 I always thought he was pretty ugly for a dinosaur. 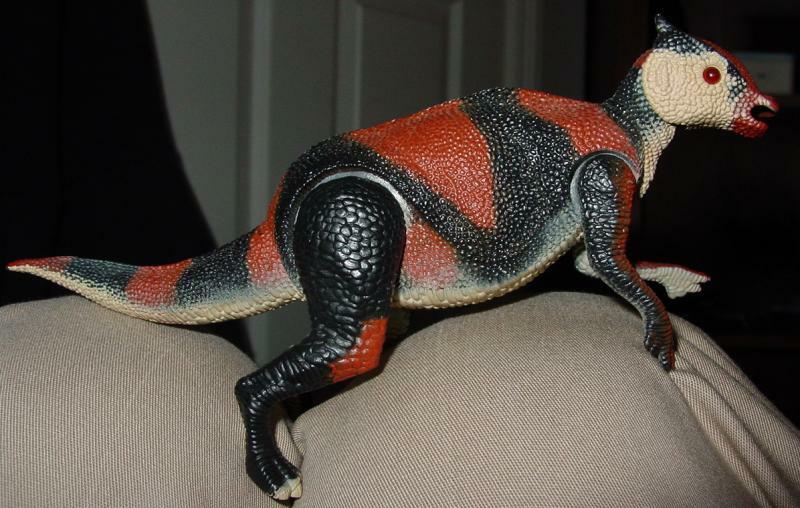 Pteranodon, this guy came with my favorite Rulon, Rasp. 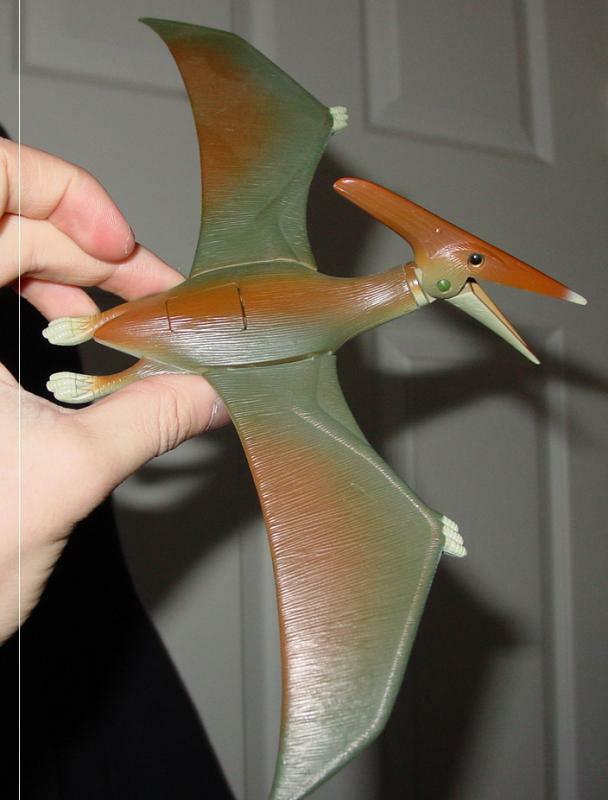 Pterodactyl, the smallest flying Dinosaur I have, wing-on view. 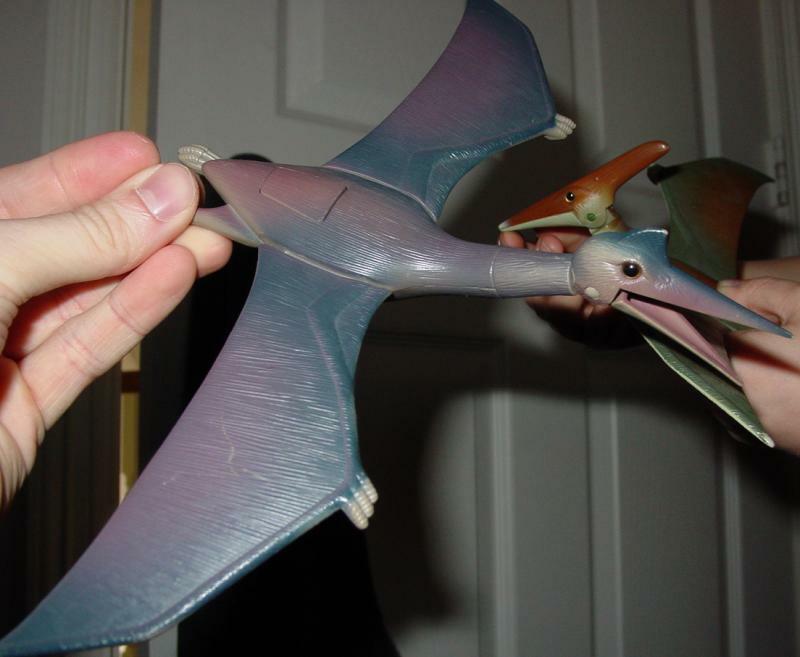 Quetzalcoatlus, the rival flying dino for the Valorians, the Pteranodon is flying in the background. 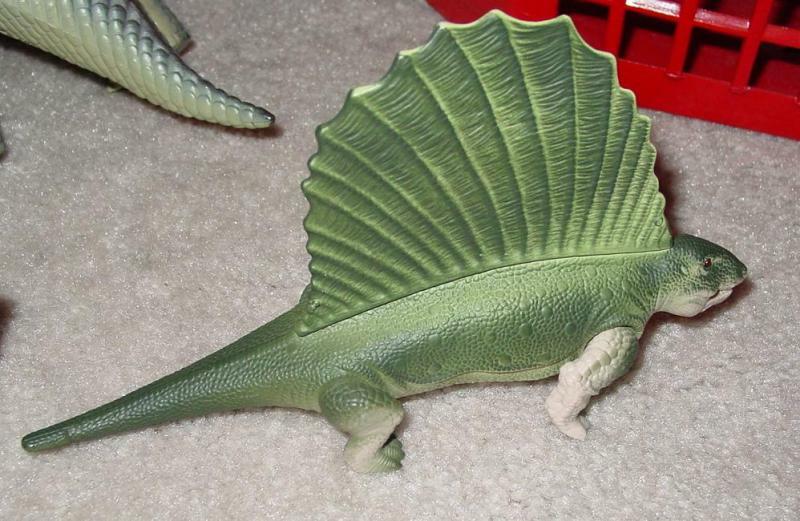 The wing-on view, the large flying dinos would flap their wings from the button on their back. 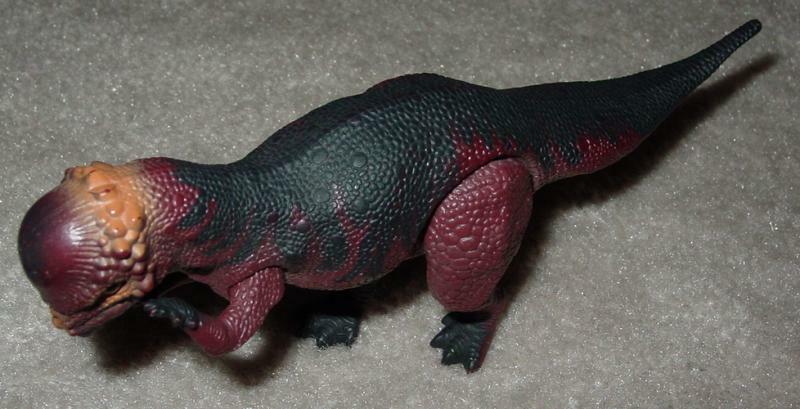 Saurolophus, I couldn't get this one to stand up on the carpet so I had to balance him on my knees. 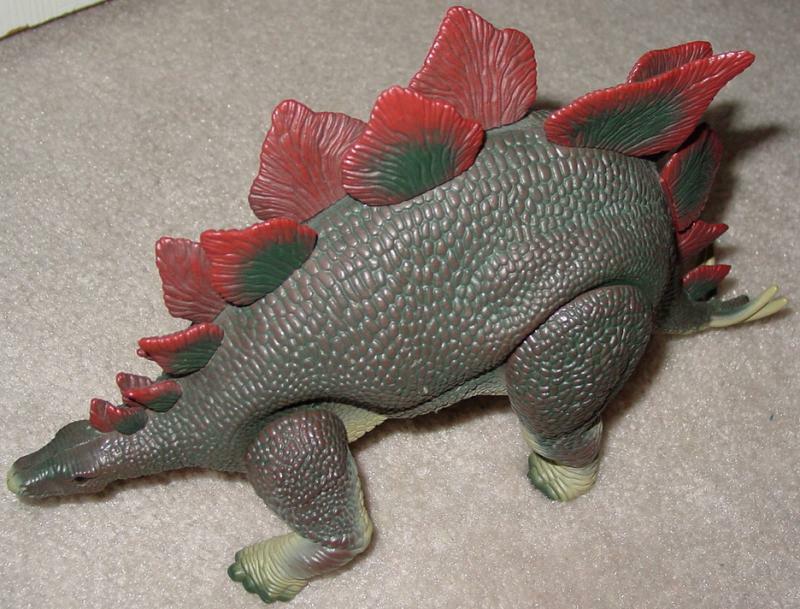 Other side of the stego. 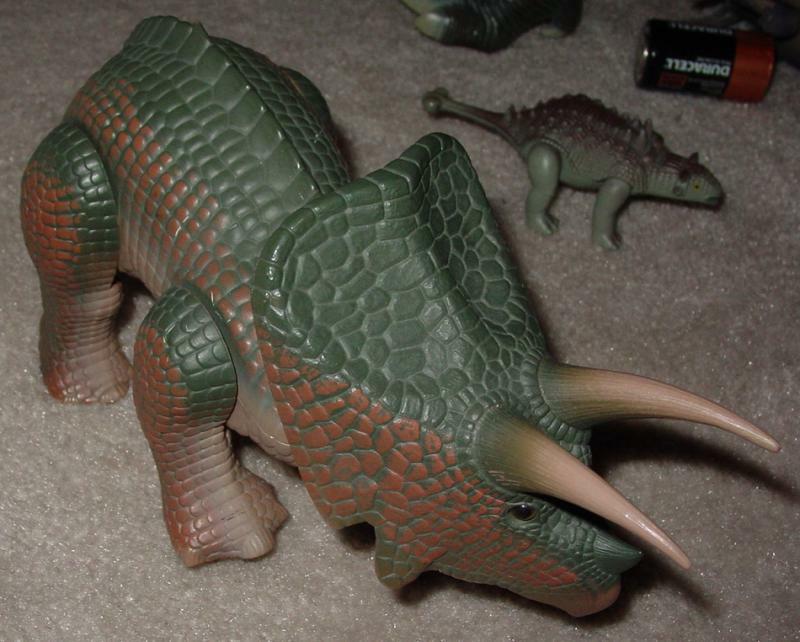 Torosaurus, without armor, he could also walk with his leg motors. 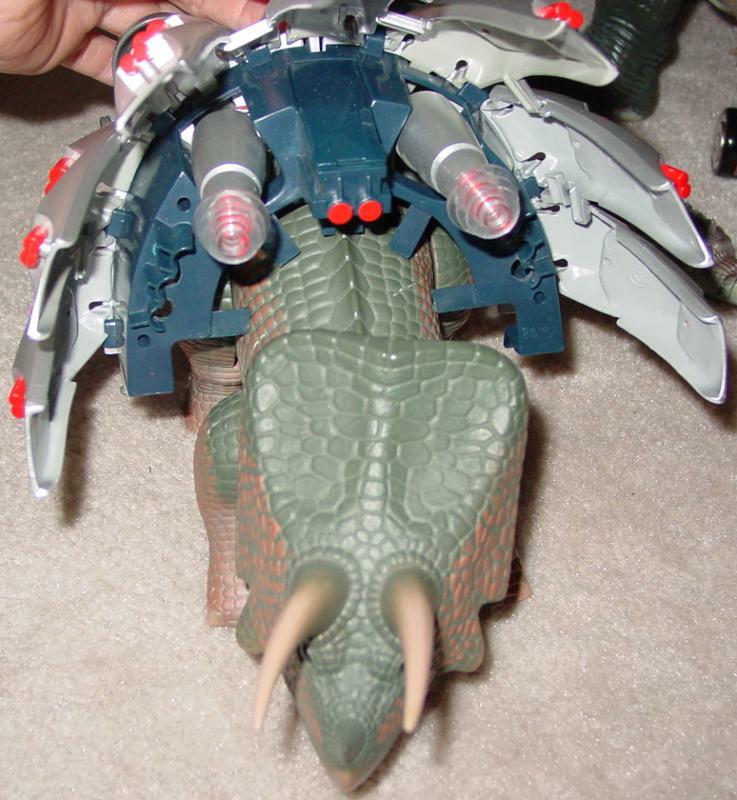 The Tyrannosaurus-Rex armored with everything I could find. 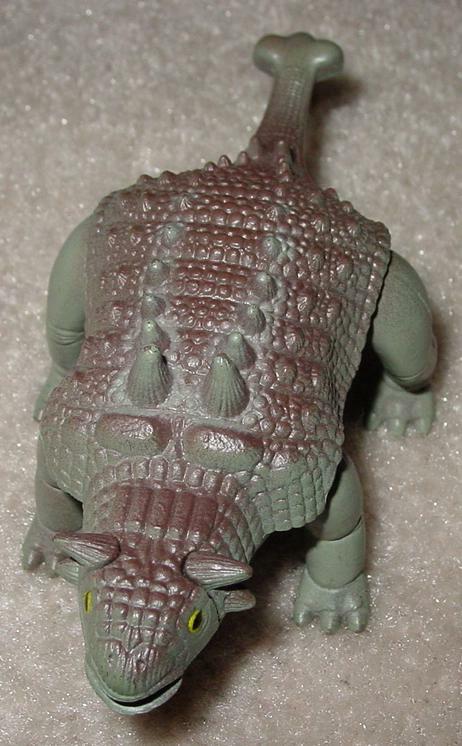 Front view, you can see the leader of the Rulons, Krulos, at the top. 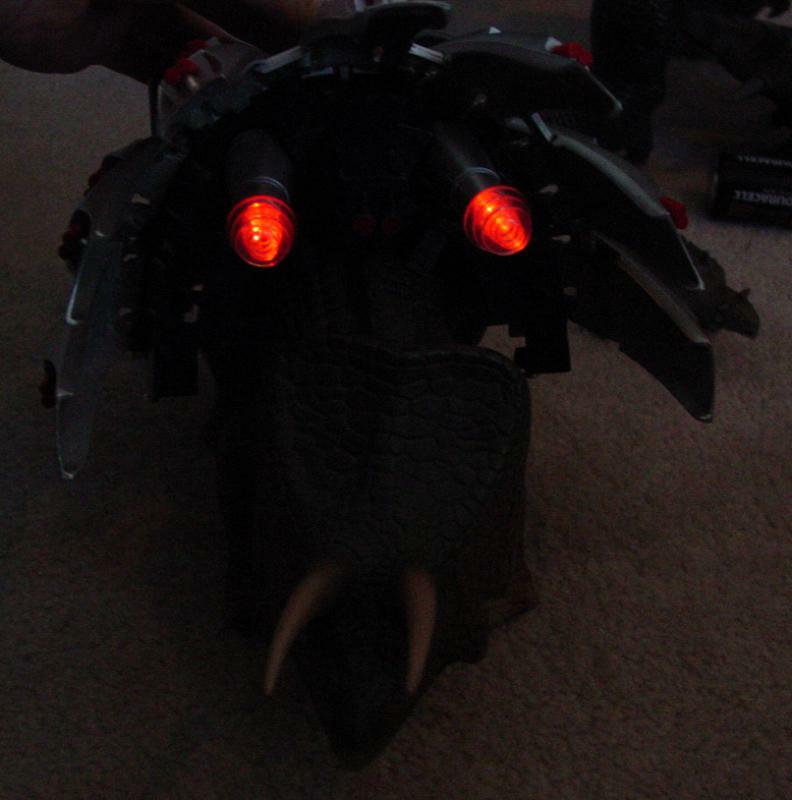 Side view, his motor switch is visible on the underside. Here are the videos of the first cartoons from the first and second seasons. It's a war of survival in 65 million B.C. - The Age of the Dinosaur. 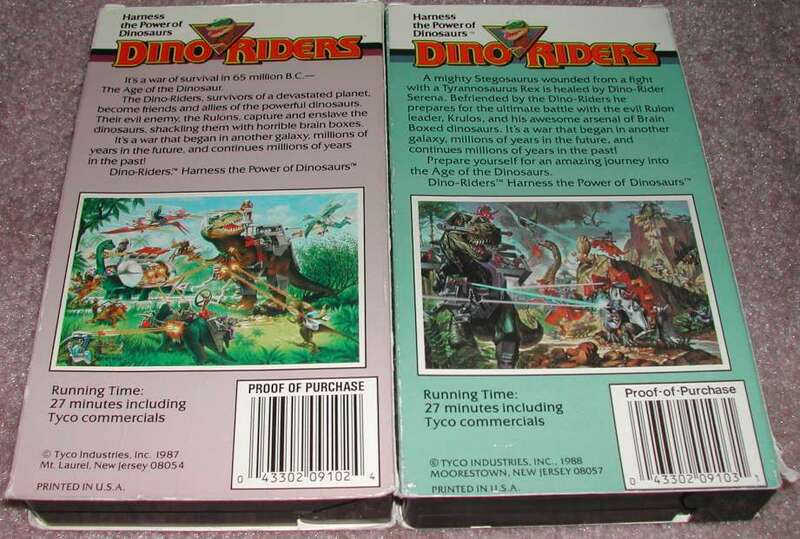 The Dino-Riders, survivors of a devastated planet, become friends and allies of the powerful dinosaurs. 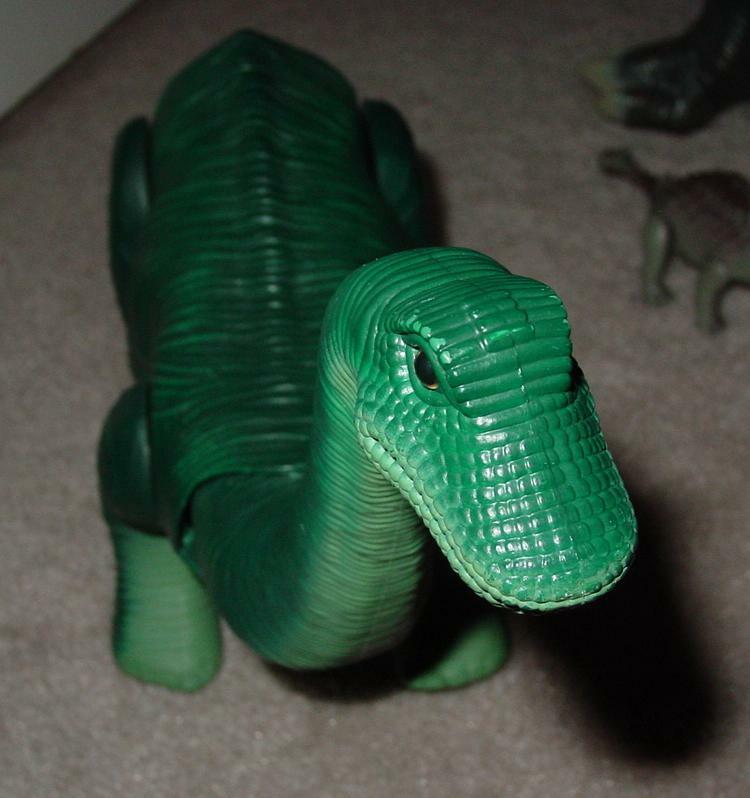 Their evil enemy, the Rulons, capture and enslave the dinosaurs, shackling them with horrible brain boxes. It's a war that began in another galaxy, millions of years in the future, and continues millions of years in the past! A Mighty Stegosaurus wounded from a fight with a Tyrannosaurus Rex is healed by the Dino-Rider Serena. 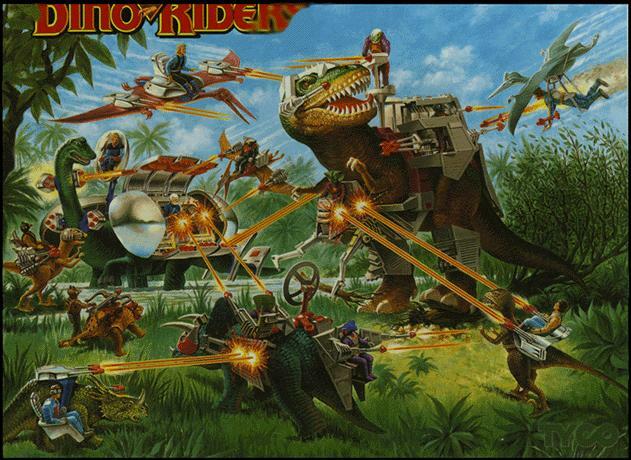 Befriended by the Dino-Riders he prepares for the ultimate battle with the evil Rulon leader, Krulos, and his awesome arsenal of Brain Boxed dinosaurs. It's a war that began in another galaxy, millions of years in the future, and continues millions of years in the past! Prepare yourself for an amazing journey into the Age of the Dinosaurs. 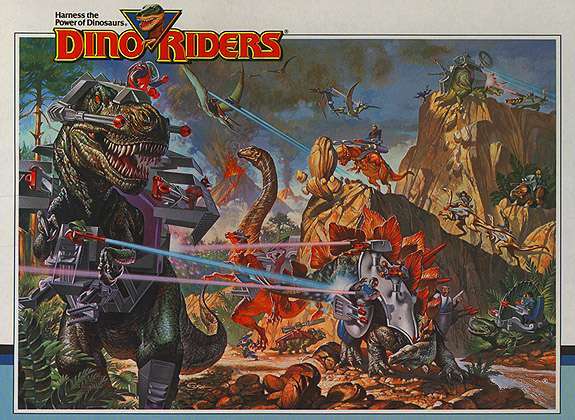 Everything about Dino Riders - covers pretty much everything about the Dino Riders from the action figures, to the TV show. 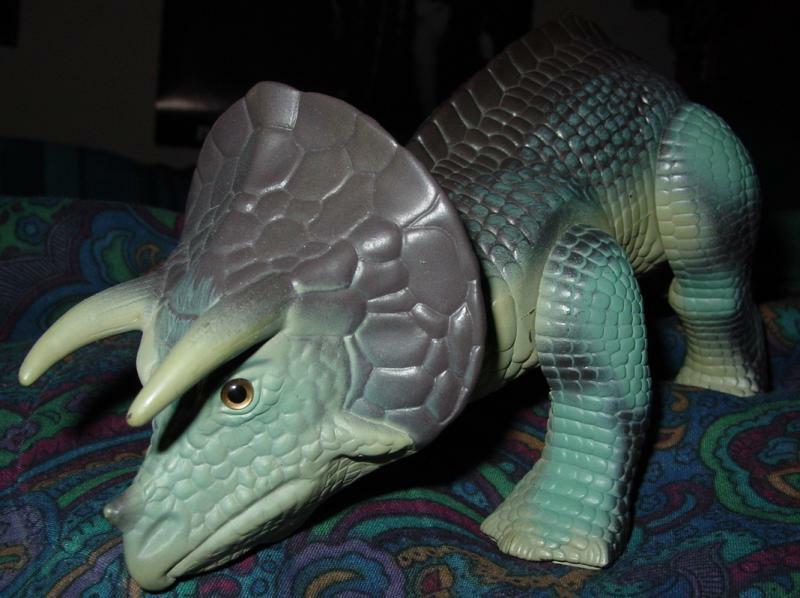 X-entertainment Classics - Dino Riders - Some sort of review of the first episode along with a lot of screenshots and action figures. 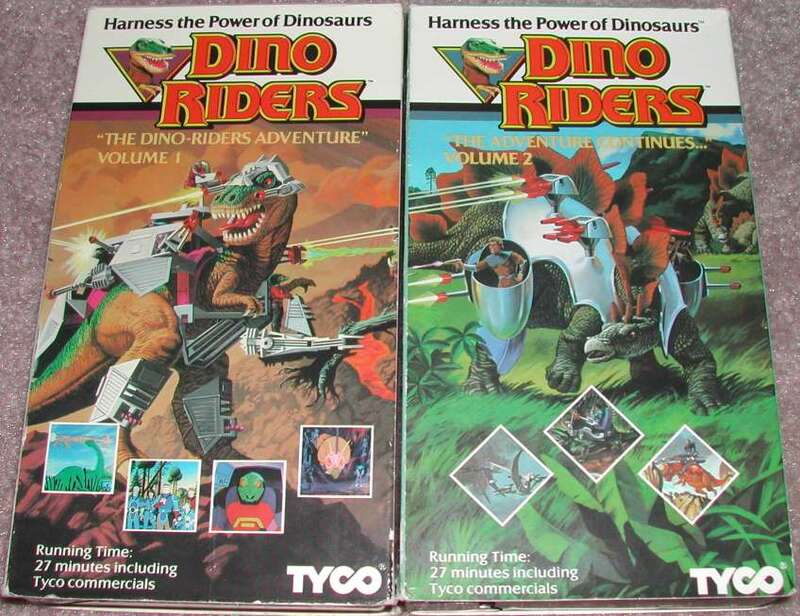 Dino Riders @ TVToMe - Extensive information on the Dino-Riders TV series.